A spiral marks the journey of the sun. 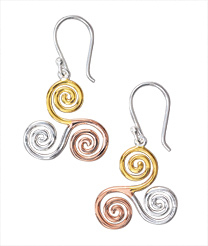 Triple spiral earrings reflect the changing light as the sun passes through the day - rosy dawn, bright noon and golden sunset. Sterling silver. I live these! They go very well with the bracelet I got at Newgrange! The triple spiral earrings are beautiful and light weight so no irritation to my ears. The back is all silver toned, but the front has the tri-coloring.